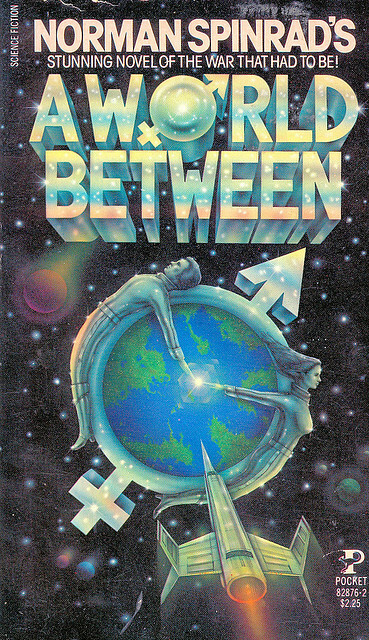 A World Between (1979) tells of a mildly turbulent period on the planet of Pacifica, a eutopic, democratic electronically mediated society, on which lands a ship from each of the two factions in the “Pink and Blue War”: the patronisingly paternalistic Institute of Transcendental Science on the one side, and the rabidly man-hating lesbian Femocrats on the other. Nobody suffers a worse fate than political embarrassment [not at all true], and status quo is restored [not really, part of the point of the book is that things do change, for everyone] by the simple fact of Pacifican society being better than that of either of the off-world factions. Its a novel about political war, with little overt violence. The lead characters are smart and clever, as opposed to fast and strong and good with a gun. That appealed a lot to me when I first read this. While it doesn’t really include gay characters, it does have lucid portraits of men and women that tweak at our perceptions. At the end, when one of the leaders of paternalistic Institute has left the planet Pacifica, but his wife chose to stay, he imagines the bond between them stretching thinner and thinner as he gets further and further away. As Dr. Roger Falkenstein stood there watching the planet recede, it seemed to him that some psychic umbilicus that linked him to Pacifica, to Maria, to what had been, was being stretched, thinned and stressed and he almost physically steeled himself again the moment when it would snap. Indeed, he wished it would snap, whipping his bitterness and confusion of the center of his being and down the long corridor of the void to oblivion. But that moment of release never came, and how foolish it was to hope that mere kilometers or light-years or parsecs could magically clear his mind of what had transpired down there on Pacifica. Falkenstein is aching both for the social changes that are bound to occur and for the loss of his wife. I don’t identify with the kind of person he is at all, and his loss is very much a function of who he is. But as I watch things in my life recede in time, I too wish that the psychic umbilicus would snap and whip my sadness down the long corridor to the void of oblivion.